I didn’t make it home until late last night, cialis 40mg but I was cold and hungry when I got there. I know I live in Miami, but my office and most indoor spaces blast the a/c all day long. Unless I wear pants and a jacket, I shiver all day. Yesterday, fashion took precedence and I wore a dress. By the time I got home, all I wanted was a big bowl of soup. Preferably, one that would be ready in 15 minutes. I had some hot Spanish chorizo, canned fire-roasted tomatoes, stock, limes and blue corn tortilla chips. A quick sautee and a simmer and we were eating our tortilla soup 20 minutes after I walked in the door. I garnished it with some cheddar cheese, fresh cilantro, sour cream and more tortilla chips. It was spicy and hearty, but still tasted fresh and vibrant from the lime and cilantro. This may just become my go-to recipe when I’m pressed for time because frankly, I’m getting a little sick of omelettes. Please note how pretty my fancy new lens makes everything look. Thanks to my awesome hub! Heat a heavy-bottom sauce pan over medium-high heat and add the chorizo. Sautee for 3 – 4 minutes until the fat is rendered and the chorizo is beginning to brown. Add the tomatoes, stock, chili powder and cayenne pepper and let simmer for another 3 – 4 minutes. Finally, add the broken tortilla chips, stirring until they soften and lose their crunch. Remove from heat and stir in the lime juice. Ladle the soup into a bowl and top with cilantro, cheddar, a bit of sour cream and some extra tortilla chips. *I like my food SPICY. If you’re not into the spice, use mild chili powder and skip the cayenne. If you like it super hot, go ahead and sub some habanero pepper for the cayenne. **My lime was super juicy, so I only used 1/2 of its juice. If you’re using a smaller lime, go ahead and use all of its juice. This looks delicious! I always order this in restaurants but have never thought of trying to make it at home. 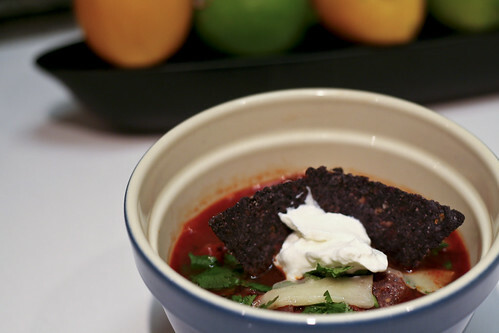 Thanks for the beautiful pictures on your blog and for the inspiration of this tortilla soup! What’s the lens? and the camera too? I find myself stopping cold in a long line of posts flying through the feed reader. Mmm. Simple, practical and good.